Engineered for elite-level racing, the Tracer Light™ has captured multiple National, NCAA and World Championship titles. Showcasing lightweight, hydrophobic quick-drying fabrication the TLSJ6A Speed Suit for women is woven with a powerful micro-filament that has enhanced stretch properties and memory retention to provide longevity and form-fit. Aerofit construction and Range of Motion (ROM) Straps allow for fluidity and explosiveness in the water, while industry leading 18 stitch/inch seams are incredibly durable and low-profile. Featuring Four-Way Lock Seams and intricately designed around the human musculature, the muscle-mapped panels of the Tracer Light™ Swimsuit will lock the core in, with up to a 25% increase in zoned compression and can decrease body circumference by up to 5%. 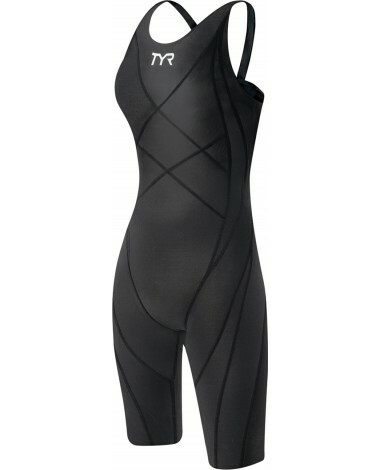 The end result is a compressive swimsuit that reduces muscle strain, improves blood flow and promotes re-oxygenation of the muscle core for maximized performance in the water. FINA Approved. Stitched and firmly reinforced eight times for a sturdy hold that won’t split. Never compromising movement in the design process, allowing for fluidity and explosiveness. My daughter loves her new suit. Fit was perfect and overage was great. Tight and fast...dropped 2-3 seconds off her butterfly and breast stroke will compete in sectionals as a 9th grader...great suit! I bought this suit using the measurement chart. I tried it on and it was an OK fit and looked good on. However, when I finally wore it to a meet, I couldn't make it through a 100 of warmup with it on. It filled with water in the chest and armpit area. Since I was out of the 30 day return policy by this time, I gave it to a teammate to try thinking it would be a better fit on her. It fit her as well and then she had the same problem at a meet last weekend. Needless to say, I spent over $100 and can get no use out of the suit. It either has defective seems or the suit is cut much different in the chest than the stated measurements. Be sure to wear it in the water prior to the 30 day return policy! Q: Do you have this suit in a 24 if so how quickly can you ship it to me? A: We currently only have a 24 Long in our Women's Tracer Light Aerofit Short John . A link is provided for quick access to ordering. We do offer Overnight shipping as an option. Q: Does this suit fit true to size? A: Thank you for your inquiry. Typically athletes will size down from their practice suit to achieve a higher degree of compression, however we recommend using our size chart to aid in your decision making process. Features like powerful micro-filament that has enhanced stretch properties and memory retention to provide longevity and form-fit. Q: This isn't the version that has an extra lining inside of it, correct? A: Thank you for your inquiry. The Tracer Light shell and lining features a lightweight, hydrophobic and quick-drying fabrication. It is not heavy, and coverage is only where needed. Q: How do I measure for the torso measurement? A: Thank you for your inquiry. To find your torso measurement; Measure diagonally from your shoulders, to between you legs. Then wrap the measuring tape from between your legs and up your back to the starting point.